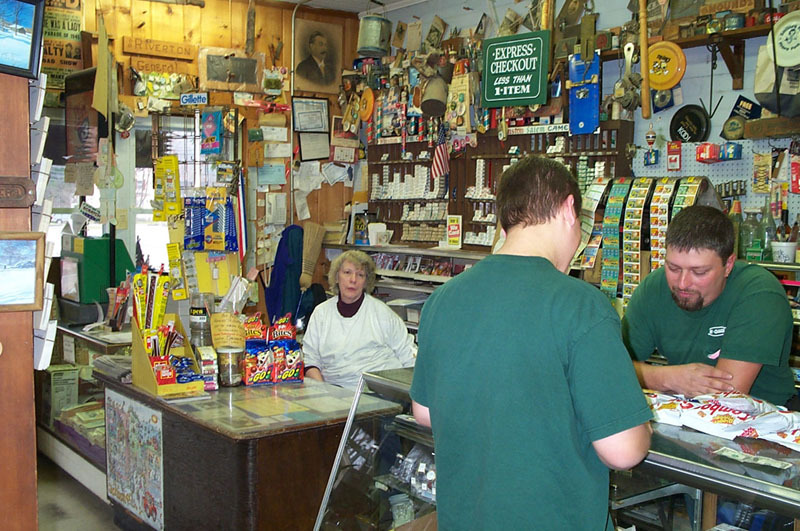 Small country stores may have changed over time, but there is no doubt that the local store is still an important part of the neighborhood. This is certainly true of the Riverton General Store -- can you imagine Riverton without the store? Located in the heart of Riverton (literally and figuratively) the store has been operated by Ed and Roberta Petit for 22 years. The Riverton store has been in business for about 120 years in this location. Due to health concerns, the Petits have offered the property and business for sale, but it was not an easy decision. "I love this place," says Roberta. She and Ed enjoy the work and talking with the customers. Roberta often knows what many of the regulars want before they even step up to the counter. 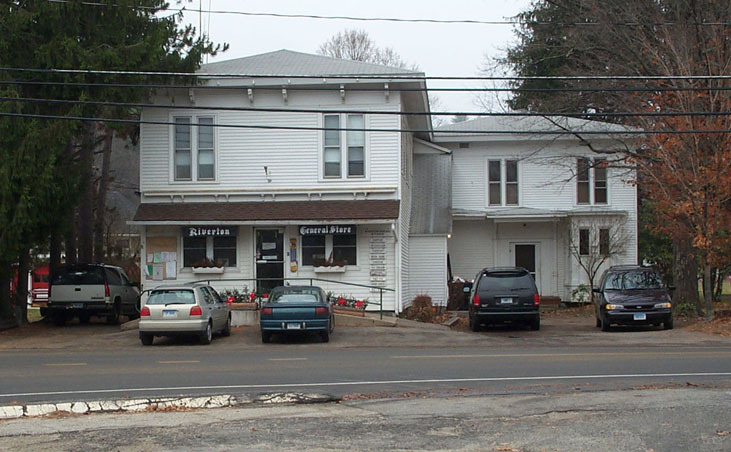 Photos above- The Riverton General Store, November 2002. The Petit family members are veterans in the store business. Years ago, Ed and his brothers operated super markets in towns like Plainville, Southington and Bristol. In the 1970s, brother Ken took on operation of the Riverton Store which was then owned by Ernie and Lois Jordan. Due to poor health, Ken passed on operation of the store to Ed and Roberta. They loved Riverton and after a few years decided to buy the store from the Jordans. 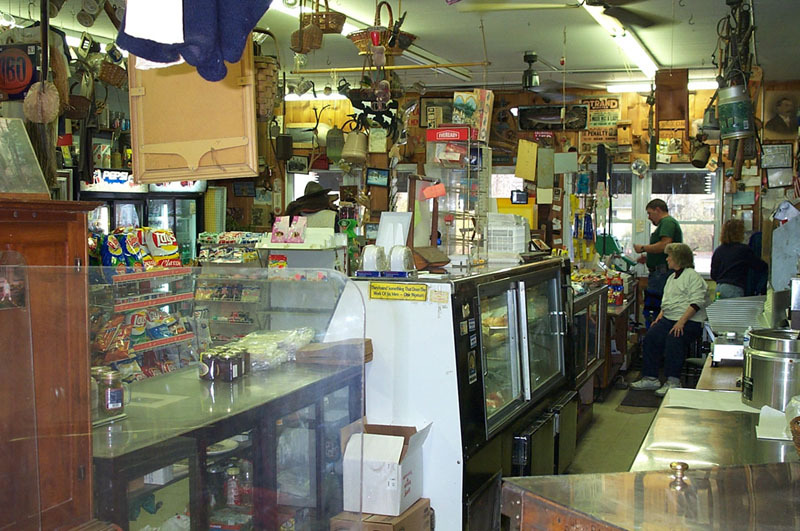 One of the first changes made by the Petits was to give the business a country store feel. In addition to the food and other items normally sold in a small store, they added collectibles, old posters and photos -- not for sale but displayed for the enjoyment of the customers and to add to the warm atmosphere of the store. Another change was the addition of a deli counter offering soups, salads and sandwiches. This proved to be very popular and has developed into a big part of the business. The store also sells State lottery tickets. Ed says the biggest winner that they know of was a lucky customer who won $1,000 on an instant ticket back in the early 1990s. Roberta Petit (at left), Riverton General Store. Behind the deli at the Riverton General Store. Customer traffic has been good at the store, with a mix of fishermen, sightseers, bike riders, hikers, motorcyclists and local residents. Regular customers stop almost daily for coffee, the newspaper and to chitchat and keep current with the vital tidbits of local routine. At present the store is open from 5 a.m. to 5:30 p.m. Son Ed Jr. and daughter Lou Anne help Ed and Roberta keep things humming along. During busy periods, a part-time worker also assists. Health problems have reduced the number of hours that Ed can work. Let's look at a typical day at the store this November 2002. Roberta and Ed Jr. arrive at about 4:40 a.m., open up, get the coffee going and put out the newspapers. Customers start coming in right at the 5:00 opening. Coffee and the paper are the two popular items. Most of the early birds are regulars -- the same people showing up at the same time as daily routines are set in motion. 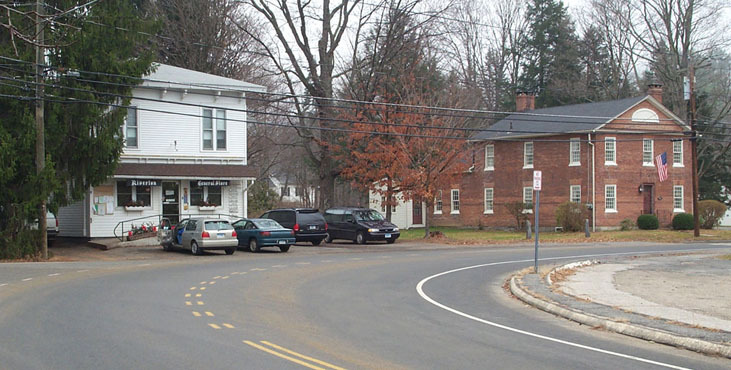 In addition to local residents, many customers are from Colebrook, funneling down through Riverton on their way to work. Roberta and Ed Jr. chat with the regulars, some leaving orders for lunch sandwiches that will be picked up around noon. At about 8:00 or 8:30, Lou Ann arrives and joins Ed Jr. at the register and front end of the store. Roberta heads for the back to prepare deli food items and to do store paperwork. Food preparations in the back involve things like peeling vegetables, roasting beef, boning chicken and making soup or chowder. 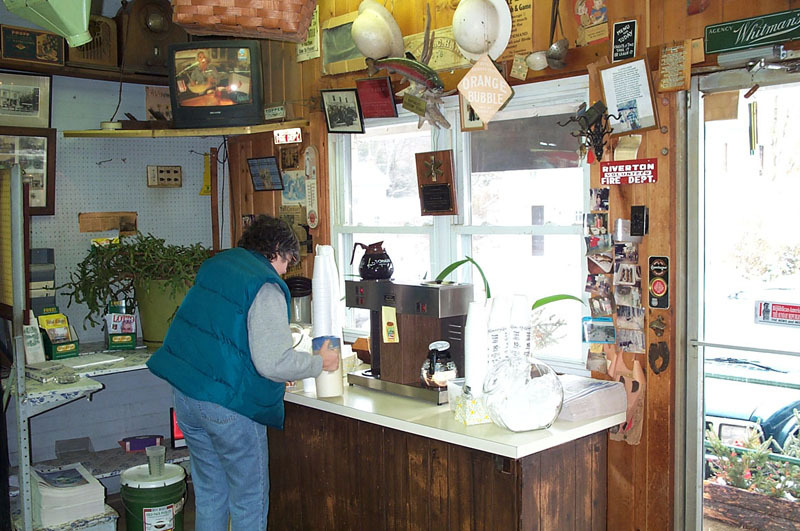 A customer getting coffee at the Riverton General Store. At about 11:00 Nancy comes in to work the deli. Nancy is a part time employee and the way she was hired is quite a story. On a very busy summer day there was a long line for sandwiches at the deli and Nancy was a customer in that line. She got her lunch and left. She is a Riverton resident and a regular customer at the store but on this day she decided to return to the store to help out her friends the Petits. Without a word she just got behind the deli counter and started making sandwiches, earning the gratitude of both the Petits and the hungry customers in line. Roberta says this is just one example of why she feels the customers at the Riverton store are the best. Nancy was hired to work the busy lunch rush at the deli. During this busy time Roberta will return to the front of the store to help out. Lunchtime normally requires three people to cover the register and deli. Salads, soups, grinders and sandwiches are ordered, made, packaged and purchased. In the winter months, the weekday lunch menu features a special sandwich (for example sausage and peppers, meat ball or kielbasa) and a soup or chowder (such as corn chowder, vegetable beef, chicken noodle or clam chowder). Today's special is a meatball sandwich ($3.49) and vegetable beef soup ($1.69 for a small cup). At about 2:00 or 2:30 things start to quiet down and Nancy can leave. Two people can now cover the front. Late in the afternoon customers stop by to pick up a loaf of bread, gallon of milk or a missing item to complete the dinner menu. The days of doing your main food shopping and filling a cart here are long gone (the store no longer has shopping carts). At about 5:00 preparations begin for closing including cleaning up and washing down the deli. The store closes at 5:30 and the Petits are on their way home after another busy day at the Riverton General Store.